With the famous German Trotec brand, the pedigree of these high quality dehumidifiers is assured. A strong 1.8 kW rotary compressor and a quality fan for air flow rates of up to 1,500 m³/h. 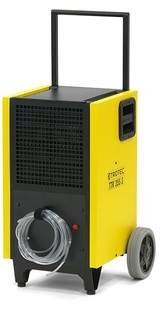 can remove extreme humidity of Up to 150 litres per day.The high-quality hot gas automatic defrost of the KDG150L guarantees a much more efficient dehumidification performance Frequent location changes, and use in rough construction site conditions, are not a problem for this condenser dryer. Thanks to the ergonomic construction and carriage design with a bar handle and large wheels, the KDG150L can easily be transported over uneven terrain or up and down stairs – the rotary compressor makes it possible to transport it anywhere.